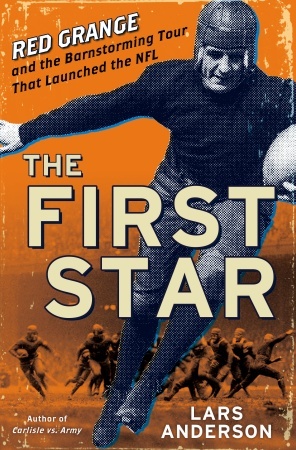 Lars Anderson, author of Carlisle vs. Army: Jim Thorpe, Dwight Eisenhower, Pop Warner, and the forgotten story of football’s greatest battle, has just had The First Star: Red Grange and the barnstorming tour that launched the NFL published by Random House. This book follows on the heels of Gary Poole’s biography of Harold Edward Grange. Anderson delves more into the early days of Grange’s professional career — the barnstorming tour that took Grange east to New York, south to Florida, and, finally west to the Pacific coast. The barnstorming tour was brutal and likely contributed to Grange’s shortened injury-laden career. Grange finished playing college ball on November 21, 1925. Five days later he was playing pro-ball on Thanksgiving, much to the shock and dismay of many. The barnstorming tour began after Grange helped the Bears for two games in Chicago as their season was winding down. The tour went through St. Louis, Philadelphia, New York, Washington, Boston, Pittsburgh, and Detroit, over an eleven-day period, before returning to Chicago for another home game on December 13th. Then the tour, beginning on Christmas Day, 1925, took a second leg of nine games to Coral Gables, Florida, ending in Seattle on Jan. 31, 1926. The allure of the barnstorming tour and its profits caused tension between Grange, his manager C. C. Pyle and George Halas. By the next season Pyle had created a start-up rival football league with Grange as its, unbeknownst, injured star. The plan failed and Grange returned, somewhat hat-in-hand, to Halas and his Chicago Bears — never really the same physically. Grange had changed professional football, but it also taken its toll personally.